I graduated last June. It’s taken me until this fall to realize the full effects of this act. September came and went without one of my favorite yearly rituals: buying new school supplies. How can I say this so it doesn’t seem exaggerated? I LOVE school supplies. It’s my reason for being. I love shopping for them, I love organizing them on my desk, I love the smell of sharpening pencils just before my electric sharpener gets overheated and poops out. After 16+ years of education, I’ve finally honed in on the best supplies for my exact studying habits, only to graduate and have these habits completely changed. In homage to this love of school supplies, I will list some of my favorite office supplies. Because a visit to Office Depot can sometimes be a religious experience. Now, I’m something of an organizational freak. I love to plan, and to color-code, and to know the conversion between Fahrenheit and Celsius. Choosing the right planner is not a task I take lightly. I need space in each day, for each hour of the day (even if all I put into the hour is what rerun episode of Boy Meets World I’ll be watching). The perfect planner for my hyper-intensive needs is the Moleskine weekly planner, complete with pocket, appointment stickers, and a miniature notebook that is just blank pages and can be removed in a note-taking emergency. It also comes in red, which is a huge plus. Because I write and doodle and color-code a lot, a good set of pens is essential for frist drafts and good note-taking. I like to write with an ultra-fine tip. It keeps my handwriting neat and easier to read, and I generally use felt-tip because ballpoint can either get clogged up or goes too fast, so that my thoughts don’t have time to catch up with my hand. This is a fun set I keep with me almost always, I love the color options. Finding the perfect notebook is something that I’m still working on. I like a larger size because I have this niggling theory in the back of my mind that small pages can only contain small ideas. Plus, I like to gesticulate wildly in my writing, and I need the space to do so. I also prefer unlined paper. That way I can write or draw or just scribble any which way and nothing breaks the continuity. If pressed, I can be okay with graph paper, but that’s pushing it. I also have a block against fancy, leather-bound or otherwise important looking notebooks. They tend to seem too proper for my little silly thoughts, and then I never actually write them. Scattered across my bookshelves are beautiful journals, wihtout a single line in them. 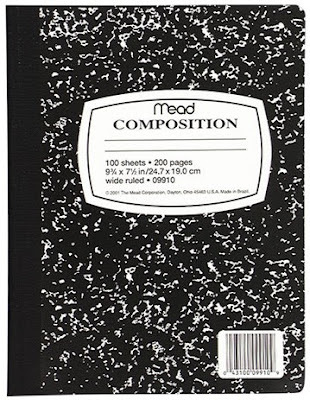 The best I’ve found so far is the simple Mead Composition book. It’s portable, incredibly durable, and comes with clean, unlined pages. I read books. Every once in a while, a phrase will strike me as important and I’ll think to myself, “How can I shed light on this phrase later, should I want to find it quickly?” In these situations, the highlighter is my best buddy. But a highlighter with little flags in it? That might be my new soul mate. You see, after highlighting a phrase, you still have to flip through the pages looking for your neon pink peals of wisdom. With this two-in-one item, pictured above, I can mark the page, and put a flag on it to cut out this page-flipping process. The only thing that could possibly make this any better is if it were somehow dispensing chocolate and had an automated laugh track that followed me around like a bad sitcom. Are there no more school supplies in my future? While I miss shopping for school supplies, carefully choosing the vehicle of my term papers and semester’s notes, I have discovered a world beyond school supplies: Office supplies. No, you don’t get to choose these things for yourself, but they are paid for by someone else and come in bulk! This is also where I discovered my love of stamping the exact time and date onto any and all documents that come across my desk. See, fellow post-graduates? Not all is lost. Be sure to check out the other things I love this week, including key chains, rude blogs, and old stuff! And if you aren’t already, go ahead and follow me on twitter @emaydavis and you’ll get to see some of the fascinating inner-workings of my mind unravel before your very eyes! What’s funny about this is halfway through I thought, “Erin, you can move from ‘school supplies’ to ‘office supplies. '” Then two lines down, you said the same thing! I share your obsession. I have a shoebox full of pens, one with markers, one with colored pencils, one with crayons, and a bunch of overflow. And too many sticky notes. Thank you. That is all. 🙂 Luvs! I’m psyched to see in you January! I will not, however, be honoring your wishes in regards to the color palette. I MUST have disorder in some ways, and this allows for the discovery of new color combinations! I hope to convert you to my religion of colorosity upon our next meeting. I’ll prepare a power point.